Choosing basketball plays for your team is one of the most critical decisions you’ll make as a coach. It’s essential to consider the skill and experience level of your roster, the strengths and weaknesses of your players, and the types of defenses you’re likely to face. On this page, we’ll introduce several basketball offenses and provide some specific set plays that you can implement with your team. You’ll also learn some basic principles to successful offense, which should remain top of mind no matter what basketball plays you choose to run. 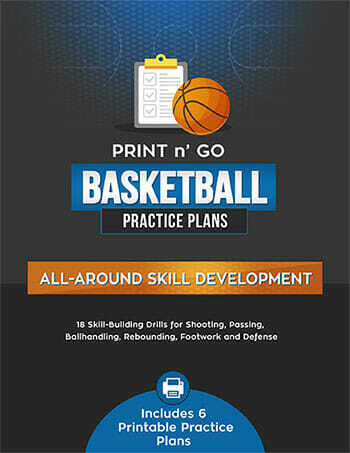 If you’d like to get on the fast track, make sure you check out our series of downloadable basketball playbooks. No matter what basketball plays you run, it's critical for your players to understand the fundamentals and concepts for successful offense. Below, we've broken down 12 basic principles to help your team get better spacing, better ball movement and more high percentage shots - no matter what type of defense you're facing. First off, you’ll want to figure out if you’re going up against a man to man, or a zone defense. Versus a man to man, you'll probably run a 3-out-2-in, 4 out or a 5 out set. 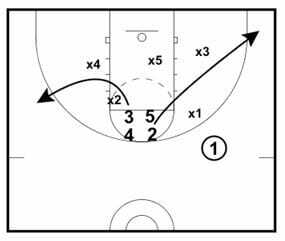 Versus a zone, you'll probably want to score in transition, run a 1-4, or a zone offense. How do you find out whether it’s man to man or zone? One way is by scouting. Watch your opponent play in advance and see what their go-to defensive set is. Another way you can find out at anytime is by sending a cutter through the paint. If a cutter goes from one side of the court to the other, and the defender stays with that cutter, you’ve got yourself a man to man defense. If the defenders move to a certain border before handing off the cutter to another player as he enters a new area of the court, you’ve got a zone. Every defense has its strengths and weaknesses. For example a sagging type defense, where their priority is locking down the paint, will be very tough to penetrate or feed the post against, but will as a result concede many more three point shots. Or, you could be playing against a high pressure defense, one that is going to be active in the passing lanes, getting right up in your shorts. In that case you’ll look to take advantage of the lack of help defense, and go to your plays with backscreens, backdoor cuts, or even feeding the ball on the block. If you have a chance to look at tape, or are just going up against a team that you see on a fairly regular basis, you may be able to even take a look at some other aspects of their defense – like whether they have defensive endurance (ie. a team’s ability to maintain intensity and focus through upwards of six or seven passes). If a team tires quickly or loses their defensive concentration after a few ball reversals, emphasize that fact to your players and encourage them to swing the ball around several times before taking a shot. Creating and taking advantage of mismatches is one of the ways you can have a huge impact on the game as a coach. If your big men are towering over your opponents down on the block, you need to exploit your size advantage. If your guards are running circles around your opponent's backcourt, increase the tempo of your offense and run plays that allow your kids to excel in the open court. A player’s effectiveness on the court will be largely due to the role you as a coach put them in. When you look at a team like the Detroit Pistons of the 2000s that went on to beat the Lakers super-team in the finals, you see a team that had clearly defined roles for every player in the starting lineup, letting them all play to their strengths. A player like Ben Wallace would be completely ineffective if you installed basketball plays around his ability to score on the low block – but letting him focus on anchoring your defense, setting tough screens on offense, and cleaning up the boards makes him an incredibly valuable player. You want your creators to create, your shooters to shoot, and your screeners to screen – coaching is all about putting players in a position to play up their strengths and mask their weaknesses. Also, if you’ve got a player who’s hit a couple shots in a row and has got a hot hand -we want to get them the ball. Or if there’s a defensive player who is getting close to foul trouble, we want to put that player in a precarious situation and force them to either play weak defense, or challenge them to avoid picking up their 4th or 5th foul. It doesn’t matter how good a screen your players set if the timing is off on the pass. We want to hit our players as soon as they come off the screen so that they can take full advantage of the opportunity given to them by the screener. Likewise, it's the player who is using the screen's responsibility to wait until the screener is set, and to rub off his shoulder in a way that prevents his defender from trailing effectively. The screener should focus on getting big and wide, holding his ground, and avoid moving his feet or leaning to the side. Some of the basketball plays in your offense will be designed to score within one or two passes. Others will have more continuity, that involve six, seven, or eight passes to create the right opportunity. Make sure your players understand the difference, and have the patience to work the ball around under the right situations. a) Advancing the ball upcourt or penetrating to the basket. b) Improving your passing angle. c) Shifting the defense before initiating a play. The last one technique is a bit uncommon, so allow me to explain. When starting the offense, try having your point guard dribble to the "non-play" side first. For example, if we want to take the ball to the right side of the court, start by taking two or three dribbles to the left. As he takes it to his left, the defense will shift, and when he crosses over quickly back to the other side, we can take advantage of the help defense scrambling to get into position, rather than just keying in and being able to lock down one side. Your team's ability to pass the ball accurately, using the correct technique will have a major impact on the flow and effectiveness of your offense. 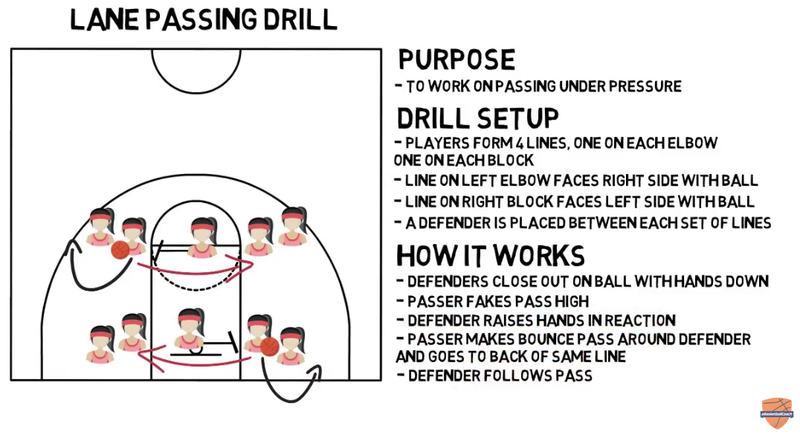 Spend time in practice working on all the important passing techniques, and help your team understand when and where to use each one. The triple threat position is extremely important out on the perimeter -a pass out on the wing should always be received and moved immediately into triple threat position. From there, we move the ball into our hip pocket, where we can pull up for the jump shot, explode forwards with the dribble, or fire the ball out with a crisp pass. In what is really an extension of the triple threat position, tell your players they need to always be ready to shoot the ball on the catch – especially when they’re coming off screens. The same principle goes for your big men down on the low block; they need to be ready to go up strong with the ball before the defense can converge down low on their position, forcing a strip or a blocked shot. To get your players ready and comfortable with going up with the ball that quickly, you need to make sure that you spend the time in practice working on a variety of moves that they can go to down on the block, including the drop step and jump hook. One of the hardest things for the untrained basketball eye to notice is the importance of setting good screens. A good screen can make the difference between a wide open shot and an easily contested one. But the responsibility isn’t all the screener's. Teaching your players how to use screens properly, waiting until they’re set, misdirecting away, and coming off tight and low, rubbing their shoulder with the screener’s hip so there is absolutely no room for the defender to squeeze through. One of the surest ways to give yourself an advantage – no matter who your opponent may be – is to get more possessions over the course of the game. And one of the easiest ways to get yourself extra possessions is by learning how to attack the offensive boards effectively. Some of it will be luck, and there is also a strategy you can adopt, but for the most part, offensive rebounding is all about effort. But as offensive players, your team can take advantage of their knowledge of how a certain play will end. 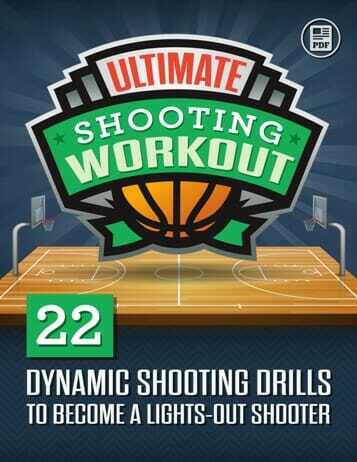 For example if you have a set play and you know that the shot is going to be coming from the left side of the court, or big man down on the right block immediately knows, he can establish inside position, because he knows once the shot is in the air, we’ve taught him that roughly three quarters of the time on a missed shot the ball will bounce to the weak side. 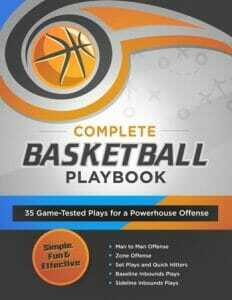 Now that you understand the basics, it's time to check out our complete catalog of basketball playbooks. 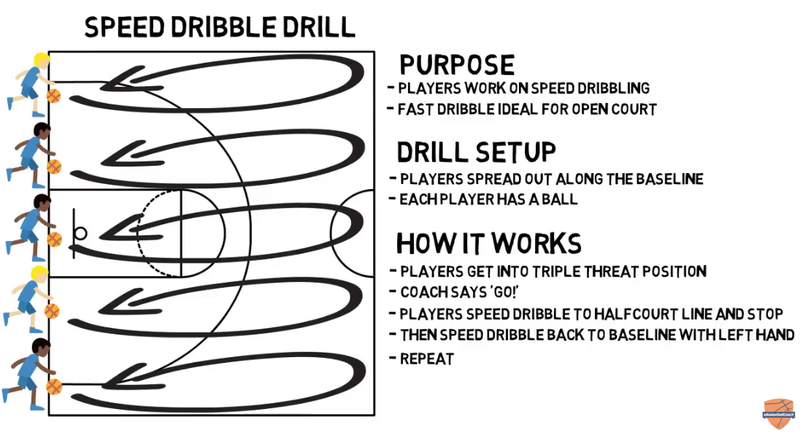 Or, if you're looking for skill development ideas, you can see all our available basketball drillbooks as well. The Complete Basketball Playbook is jam-packed with 35 tried and true basketball plays, guaranteed to work at every competitive level. We've included plays for man to man offense, zone offense, quick hitters, inbounds plays, zone defense, press breakers and full court pressure. Each play is described with detailed X's and O's, player responsibilities, options, and execution tips for coaches. 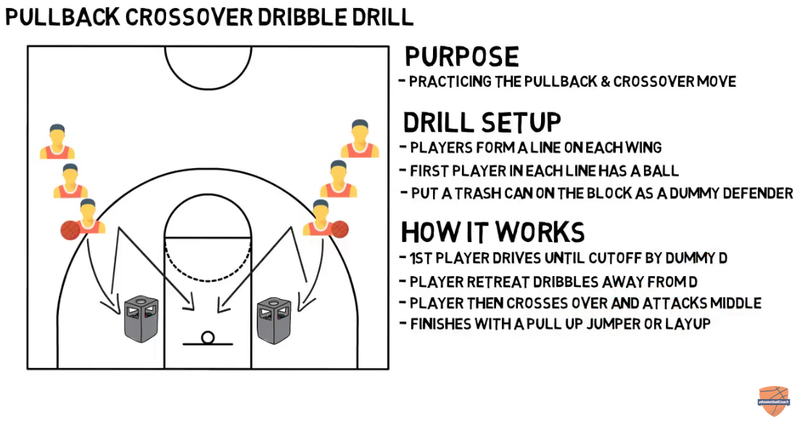 So you can learn these basketball plays today, and start dominating your opponents at your very next game! Click here for instant access. You’ve really change our games and improve our tactics. That’s a ton of good information! Thanks for the article. Great read.